Apologies to the British Museum, where this image and text came from, but I felt it was worth taking a copy here, in case they decided to remove it from their site. In any case, copyright for this material rests with them. 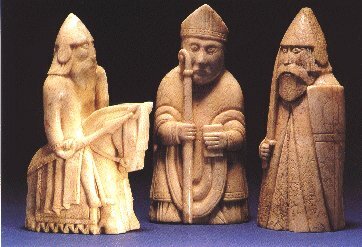 Dating from the Mid 12th century AD, the chessmen were discovered in 1831 on the deserted coastline of the Isle of Lewis in the Outer Hebrides. The hoard apparently contained the remains of 4 complete chess sets. In 1831, 67 of the chesspieces were acquired by the British Museum and in 1888, 11 pieces were acquired by the National Museum of Scotland. They represent the finest group of early chessmen to have survived.